If you dig through TV Tropes, you’ll find several categories that relate to Fox in the LFBD universe: talking weapons, empathic weapons, etc. None of them fit exactly, because while Fox is a weapon, he’s actually a lot more than that. It did get me thinking about the trope in general though. 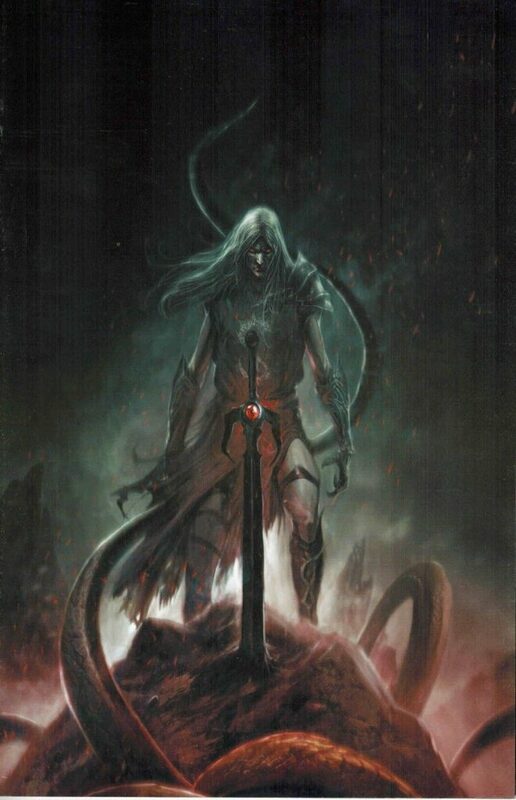 Maybe the most well-known sentient weapon is Elric’s sword Stormbringer. While Stormbringer is just a fictional weapon, I’ll allow it, because I like the artwork attached. This is from a comic series. I liked the original books by Moorcock, though I can’t vouch for these comics. The artwork, however, is great. I love this take on Elric — usually he is presented as very muscular, and even heroic. Here, it’s clear why the others of his race who prized strength, elegance and cold beauty despised him. And of course, there’s Stormbringer, sucking the soul out of some giant nasty thing. Lincoln, Fox and the Bad Dog temporarily only $0.99!